When you start to see fat-tire bikes showing up at your neighborhood Target, is it safe to say that this trend is more than a flash-in-the-pan? While these off-road cruisers with their behemoth tires may look like something out of a cartoon, it’s now been nearly a decade since Surley introduced its purple Pugsley, which brought what was then a concept used mostly by endurance riders in Alaska and other extreme locals into the mainstream. OK, mainstream is going too far, but at least you can now purchase one without knowing your own frame builder. Fast forward 10 years and you can understand why the bikes have continued to grow in popularity. The tires, often more than four inches wide (more than double standard mountain bike tires), permit riders to take on all kinds of harsh conditions. The added size and lower air pressure allow the bike to “float” higher above the snow or sand and produce a great deal of grip. For riders in snowy environments like Chicago, this has allowed them to make cycling a year-round sport. 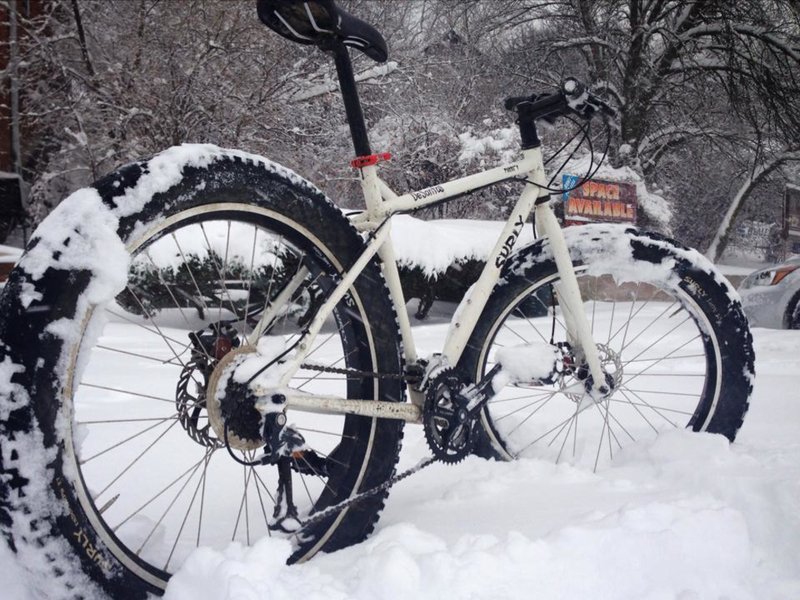 Commuters in messy environments have been turning to fatties for an all-season ride. Yes, they’re quite bit heavier than the other bikes in your garage, but users enjoy the flexibility, and dare we say it, have a lot of fun in the miserable weather. 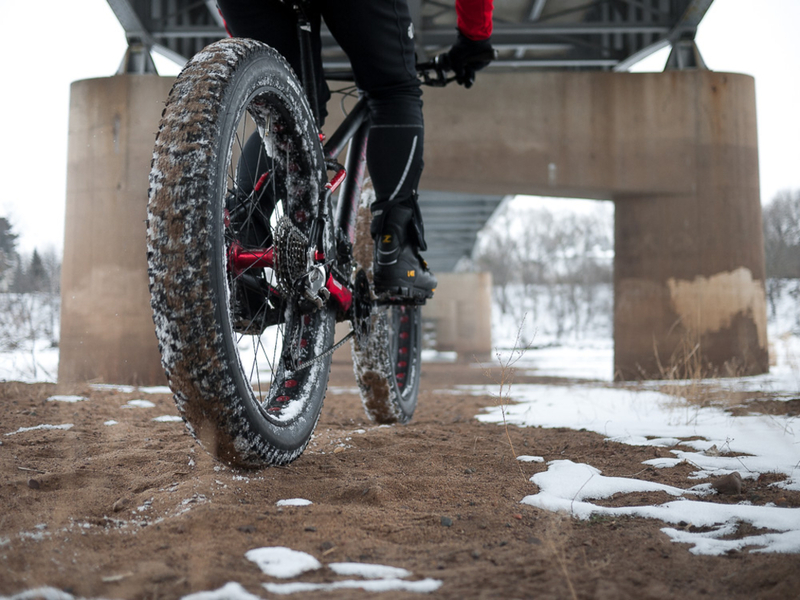 You can increasingly find other fat-bike riders forgoing the cross-country skies and snowshoes and taking their bikes out on winter trails. You will, however, quickly discover that it’s perhaps a bit more work than you’re used to. There’s not a lot of coasting through the snow, particularly if you’re breaking new trail. 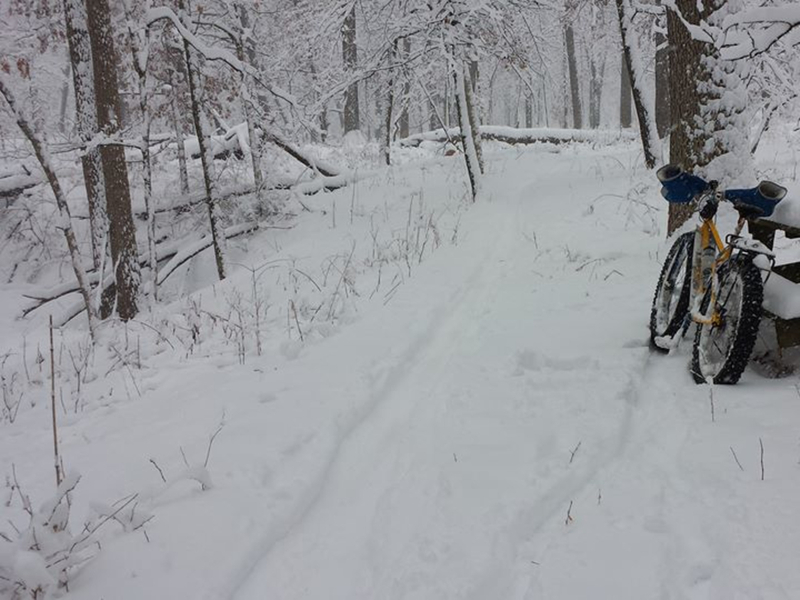 If you’re one of those looking to explore a familiar trail in a potentially unfamiliar way, here are three great options in the Chicago area that are perfect for a winter fat-bike ride. 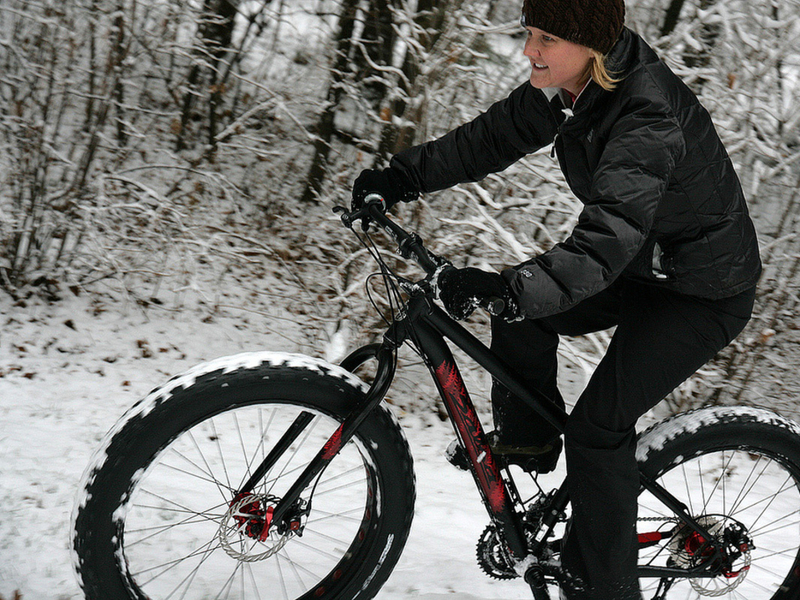 The best place to fat-bike in the Chicago area is the same as the best place to mountain bike in the snow-free months— the Palos Trail System) in the southwest suburbs, about 23 miles from downtown. Most of “mountain biking” in Chicago consists of crushed gravel trails. But Palos features nine trails of varying degrees of difficulty, with plenty of singletrack mixed in with some multi-track roads. Palos will offer plenty of hills to put those fat tires to the test, including the 8.3-mile yellow trail, which is a big loop in the middle of the preserve. It’s about a 50/50 mix of singletrack and multiuse road, and will certainly be a challenge with much snow on the trails. 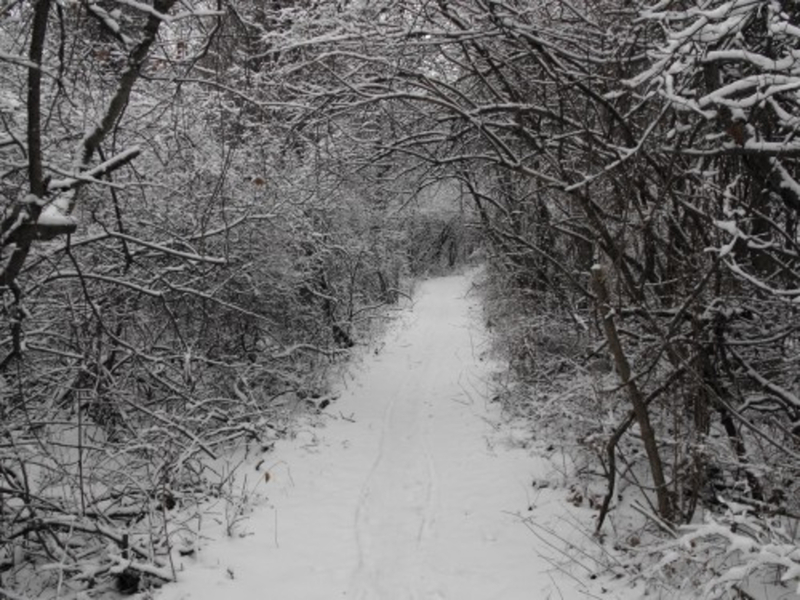 The Deer Grove Forest Preserve) offers the best fat biking in the northern suburbs, with nearly 10 miles of off-road trails in addition to several miles of paved routes that have made this a popular escape. You don’t have the volume of trails as you do in Palos, but for north suburban cyclists this is certainly the gem of the forest preserve system. Located just north of Dundee road in Palatine, Ill., the Deer Grove Forest Preserve is bisected by Quentin Road, creating east and west sections of the park. The west side is slightly bigger, and has the longest trail, The west side is slightly bigger, and has the longest trail, the yellow, which offers a 5.4-mile, uninterrupted loop. You can connect to black and orange trails on the west side and get in a good 10-mile ride without too much repetition. On the east side, which is connected to the west via a paved trail, there’s a 2.6-mile brown loop as well as the 2.6-mile paved trail. Run by the Naperville Park District, Knoch Knolls Park occupies the land between the west branch and east branch of the DuPage River before they merge at the southern border of the park. The paved DuPage River Trail runs through the park and connects the trails that follow both the west and east branches of the river. You’re hard-pressed to find anything but crushed limestone in most of DuPage County, but Knoch Knolls has honest to goodness packed-dirt singletrack, as well as miles of multitrack and grass paths mowed into the prairie. In other words it’s just about the perfect place for fat biking. The trails aren’t too long (maybe a little over five miles total), but they’re a lot of fun. The Chicago Area Mountain Bikers (CAMBR) offers a map to give you an overview to help you find your way.